With our new brushed aluminum kits you take the components including the blank dial and make your own clock. 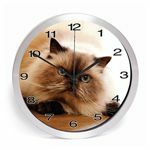 Clockparts.com also offers our customers the opportunity to purchase complete clocks with a custom dial (like the examples shown below) for an extremely reasonable price. For a small set up fee we can take your custom image and size it for either our 10 in. or 14 in. aluminum clock. While the minimum order used to exceed 50 clocks, we have made it easier than ever for our customer and only require a 5 clock minimum. If you are interested in receiving a virtual sample of a custom clock simply email us a customclocks@clockparts.com and we will work to make the clock of your dreams become a reality for a fraction of the price.